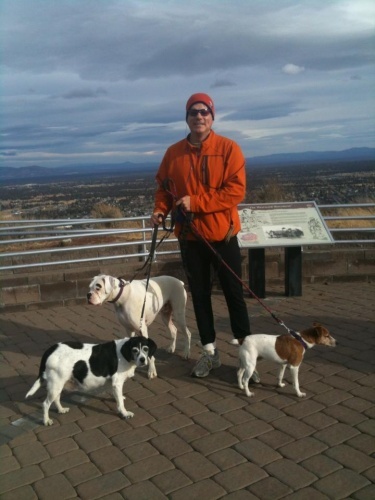 MAN VS. DOG – Who’s the Better Athlete? 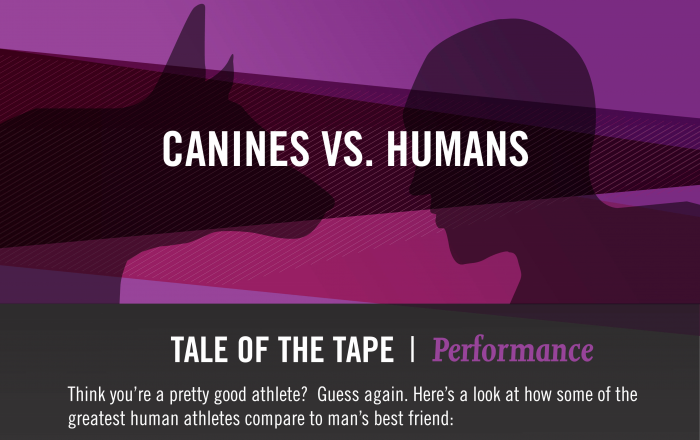 Purina Pro Plan shared their MAN vs. DOG Infographic deeper look at the average stats when comparing dogs to humans from an athletic perspective, with the Sports Techie community blog. Dogs are naturally gifted athletes and Pro Plan wanted to showcase that by putting some amazing statistics side-by-side with some of the world’s most accomplished athletes. The most amazing stat might be the 11.2 second 200 meter sprint by a Greyhound clocked at almost twice the pace Jamaican Usain Bolt ran during his world record setting record run of 11.2 seconds at the IAAF Berlin 2009. The Australian Kelpie can nearly high jump as high as a basketball hoop at ten feet off the ground. Chris Johnson tore up the NFL Combine in 2008 with his 4.24, 40 yard dash time but the Jack Russell Terrier, with shorter legs and a smaller body, did it at the 2007 Purina Pro Plan Incredible Dog Challenge in a sizzling 3.79 seconds. Humans average 7.6 hours of sleep a day while dogs get anywhere from 11.4-13.5 hours. This Big Data was compiled at the Journal of Veterinary Behavior. Knowing this stat about dogs enables owners to adjust training and recovery routines as they age. Young dogs, ages 1-5 need less sleep while senior dogs, ages 11-14 need the most sleep. Arleigh Reynolds and her team of dogs ran a 24.8 mile dog race in 1:17 hour on Day 1 of the 2103 Fur Rendezvous Open World Championship Sled Dog Race in Anchorage, Alaska. That is over 3 times faster than the average finish time at marathons held in New York City of 4:28 hours. The Purina Pro Plan SPORT Platform was created to optimize your dogs’ performance. PRiME and ReFUEL are nutritional supplement bars that launched in 2014. Give the PRiME bar 30 minutes before exercise for optimal results. The ReFUEL bar helps replace glycogen and other amino acids and is given within 30 minutes of any fitness activity such as running, jumping or swimming. The new P5 app helps users with training. Active Sports Techie dog owners can train and play with their dog with Purina’s free P5 iPhone and Android smartphone app. 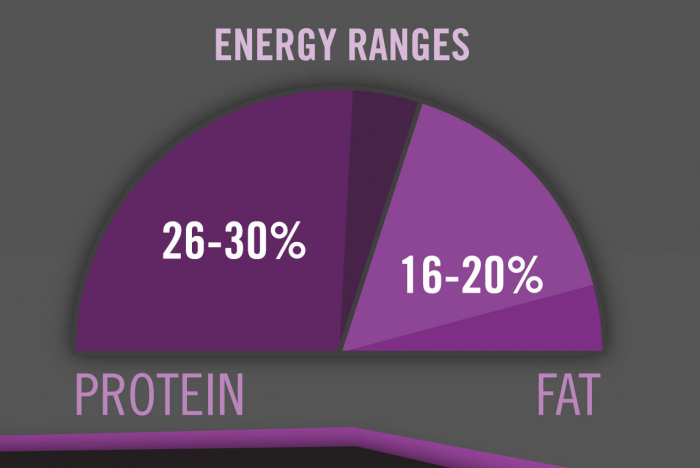 Humans use carbohydrates to do the same energy replenishment. Both require protein. The diet information is based on 40% V02 Max in the 1996 Journal of Experimental Biology. 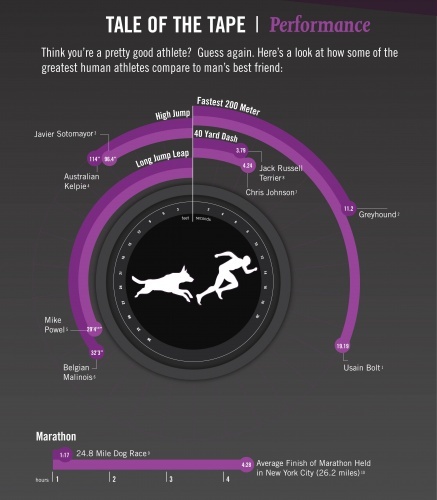 Purina Pro Plan shared their MAN vs. DOG Infographic deeper look at the average stats when comparing dogs to humans from an athletic perspective, with the Sports Techie community blog. We have a dog in our home and most likely you do or someone you know has one or more in their family pack. Be amazed at their athletic prowess and nurture their nature to play with plenty of exercise and proper nutrition. The Purina Plan SPORT Platform is based on scientific criteria. Using the P5 mobile app could be the exact tool you need to manage your pets fitness and obedience levels. MAN VS. DOG Infographic data sources provided by Catalyst: an IMG consulting company, and Purina, available upon request. Take some pictures and videos of you racing against your pet and share them with the Sports Techie community below as a comment or on our Social Media Network you can link with below. If you do not have a dog and are interested, please adopt a rescue dog or stray try using Purina products, including their innovative sports tech app.